Periodontics generally refers to the management of gum disease – though the term ‘periodontal’ refers to all the soft tissues that surround and support the teeth, not just the gums. Gum disease is a slow and silent condition that, if left unchecked, can progress steadily for many decades before symptoms become difficult to live with. Once you reach that stage, gum disease can be very complex and costly to treat. That’s the bad news about gum disease – but there’s good news, too! Gum disease is entirely preventable – all you have to do is follow a good oral hygiene routine and remember to visit your dentist and hygienist regularly. If you have been diagnosed with gum disease, our periodontics team will work with you towards controlling or reversing it in the long term. If you are suffering with periodontal disease – symptoms of which will include swollen, bleeding, sore and receding gums, as well as loose teeth or tooth loss – our periodontics team offers a number of treatment options, the most common of which is called root planing. Carried out under a local anaesthetic, this involves treating your teeth using a combination of ultrasonic and hand instruments to debride and cleanse your tooth roots. Once the initial treatment to stabilise your gum health has been carried out, we will create a tailor-made programme of longer-term care and maintenance to ensure you remain free of gum disease. Gum disease falls into two categories – early-stage, known as gingivitis, and late-stage, known as periodontitis. 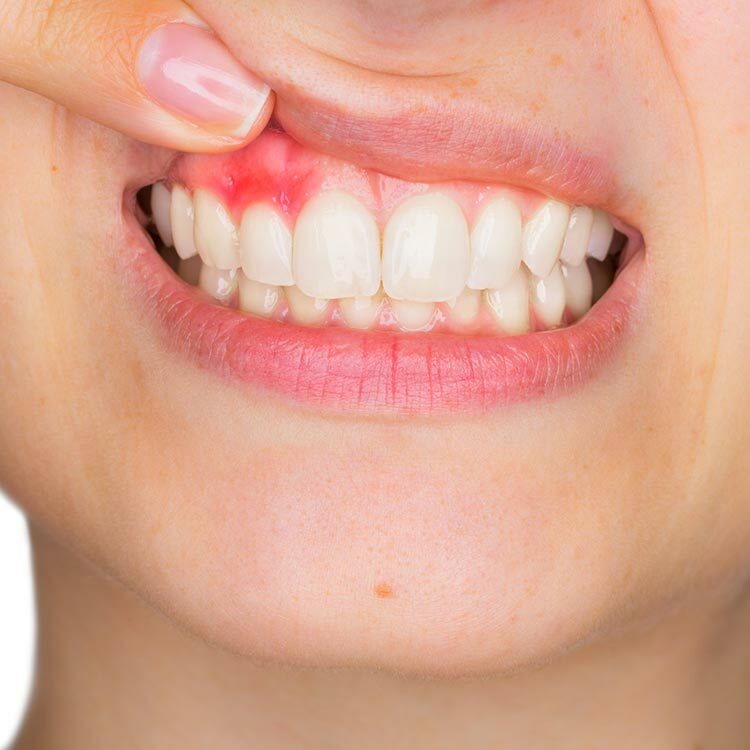 Gingivitis is extremely common – symptoms include red and swollen gums, which may bleed after brushing or flossing; this is caused by irritation from dental plaque bacteria. What happens if I ignore the early signs? If gingivitis is left untreated, it will progress to periodontitis. Symptoms of this more advanced stage of gum disease can include bad breath, an unpleasant taste in the mouth, loose teeth and painful gum abscesses. Severe cases also cause a high temperature. If you step up your oral hygiene routine, those early symptoms are likely to subside, though it’s always wise to visit your dentist or hygienist for a check-up and the most up-to-date advice. Advanced gum disease will require treatment such as root planing at the dentist, and in certain cases may require tooth extraction. At Carbasse Implant & Dental Centre, periodontal care is often the first stage of your tailor-made treatment plan, as getting your gums in top condition is often crucial before other treatments can be considered. How can I take control of my oral health? If you’re at all unsure of what you should be doing to prevent gum disease, your dentist and hygienist at Carbasse Implant & Dental Centre will provide all the guidance you need. We’ll equip you with the knowledge and techniques to create a robust oral hygiene routine at home, and we’ll help you make the lifestyle changes – such as stopping smoking, cutting down on alcohol and eating well – that contribute to a healthy mouth. We’ll also schedule your appointments throughout the year so that your essential check-ups and hygiene appointments – crucial to spotting and reversing early symptoms – are never missed.